Race 7 at Del Mar on Wednesday evening (see race replay), the daily race in Del Mar's online handicapping contest, was a microcosm of why I continue to struggle of late in nailing winners consistently, and a perfect lesson in why the really good handicapper knows when to trust his or her instinct instead of finding flaws with a horse that makes complete sense. At this rate, I am well short of the upper echelon. Two scratches shortened the field to six for the 7-furlong Real Good Deal Stakes ($100k) for California bred three-year-old horses, headlined by 9-to-5 morning line favorite Bench Points. I was initially on this horse until the odds dropped to 1-to-5 early in the wagering, and some $4k (in mythical dollars) behind the contest leader, I looked elsewhere. Few horses stood out, in what was a middling field comprised mostly of closer types, which made Chiloquin, with Martin Pedroza aboard, an interesting foil at 7-to-2 (M/L) to the favorite, considering the horse's "early" running style. (Chiloquin was only first at the first call once in his 11 career starts, but none of the others showed any success in winning on the lead, and this one showed a penchant for at least being forwardly placed.) I was supremely confident that Chiloquin would at least be near the front, and a creditable 4th-place finish in a $150k stakes in April gave this horse an added measure of viability. Instead, falling into the usual trap of trying to nail a winner at a bigger price, I landed on Warren's Knockout, who was facing stakes company his first time but who was 2-for-3 on the all-weather track and twice won on the second race off a layoff. The 10-to-1 closing price added appeal to what I recognized as a vulnerable short-priced favorite (Bench Points) at 1-to-2. 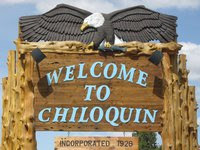 The race went masterfully for Chiloquin, who without much of a challenge set what I considered a snail-like first quarter of 23.4 seconds and half mile of 46.3. Only 8-to-1 Luckarack was within sniffing distance of the front-runner and ultimately lost by a half-length to Chiloquin, with Bench Points running on for third. Warren's Knockout finished fifth, 5-and-a-quarter lengths behind, tailing off in the deep stretch. The "reminder to self" here is to stick with my initial instinct - short field with a lone front-runner, in my view, will often equal a merry-go-round finish where there's not enough pace for the later runners to close. This loss is not the end of the world, by any means, but another good lesson on the road to becoming a more-credible thoroughbred handicapping contest player.